Sony has announced today that a director's cut of the popular Heavy Rain is due out Nov. 8 for $29.99, and will include past downloadable content, a soundtrack, Move support and bonus features. For the price given, that's a pretty sizable amount of content packed in! 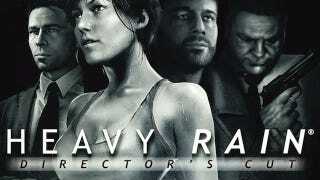 The original Heavy Rain was released February of 2010, and had mostly positive reception. Sony also offers more to PSN users, stating: "As a thank you to all current (and future) Heavy Rain fans, SCEA is making the Heavy Rain Crime Scene Dynamic Theme available FREE through the PlayStation Network to commemorate the release of the Heavy Rain: Director's Cut." A nice little extra for the game's fans, I think. The director's cut is a good deal for those who haven't had a chance to experience the game yet, as well as fanatics of the original.